A month ago we visited Zoku in Amsterdam. 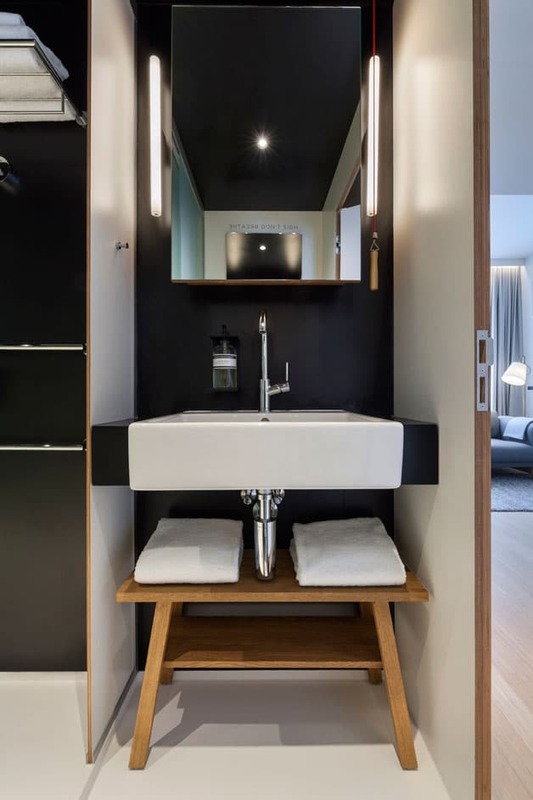 Zoku is more than 100 tiny apartment spaces in the heart of Amsterdam, which you can rent for a short period or long-term. 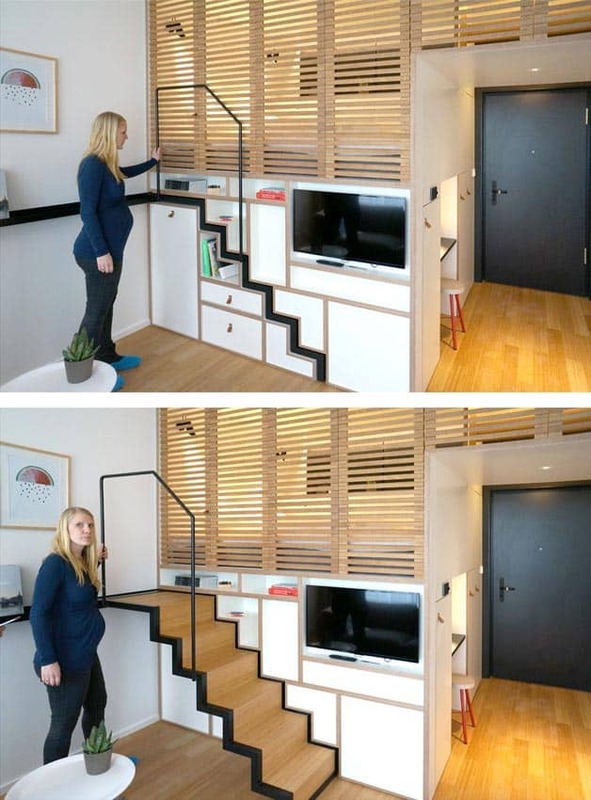 Zoku is Japanese for “Family”, and the idea is to create a place to stay and work. It is right next to a big office space / co-working space, with lots of small offices for start-ups, making it an ideal space to stay during travels. We always need to work when we travel, so this space really caught our attention! From the moment we walked into the apartment, we could sense the cozy atmosphere. A high level of attention to detail, and lots of very cool details like the staircase (pictures below), that disappears into the wall when you don’t need it. When you enter the apartment, you have lots of drawers and cabinets with storage, right next to the small toilet/bathroom. A nice detail is that the shower can be completely closed off from the toilet, with a sliding door. Making it easier to host a meeting in the apartment, without introducing people to your shower. Making it easier to host a meeting in the apartment, without introducing people to your shower. A very cool feature is the sliding staircase. When it’s time to go to bed, you just pull out the staircase and walk right up to the sleeping area, which is sealed off from the living room with the wooden blinds. During the daytime, you can hide the bedroom area by closing the blinds, and when you slide in the staircase, the studio apartment doesn’t feel like a bedroom at all. You should also check out our 35 best tips for getting the most out of a studio apartment. Besides being a really great space saving feature, it also a good way to turn the room into a great meeting room. Behind the stairs, you find lots of storage. The big drawer to the left can fit your shirts and hanging clothes, and the other ones can store the rest of your clothes. When you walk up the stairs you can collapse the blinds against the wall, to access the spacious sleeping loft. Even though the staircase is a moving unit, it feels sturdy and durable. It locks into place when fully extracted, so it won’t slide in and out when you walk up and down. The sleeping loft feels big, and it is made for two persons. Beside the bed area, you have plenty of space for books, iPads, a lamp and everything else you need to sleep comfortably. There are three variants of the apartments. The small one is 258 sq. ft. (24 m2) and the big one is 323 sq. ft. (30 m2) 495 sq.ft. (46 m2). The difference from the small one to the medium is that the kitchen is moved from the entrance to the living room area, and the biggest apartment has an added bedroom. In the living room, you find a nice table that can seat 4 people, or 6 if you seat a person at the ends. This is me sitting at the table with Hans Meyer, the founder and director of the Zoku space. This picture is taken inside the medium size apartment, where you find the kitchen area inside the living room, and not at the entrance area. Here you can see some of the fine wall art as well. Talking about nice details, you can actually choose to change your wall art if you prefer other images. You just bring it to the in-house gallery, and change it for another! In the middle of the living room area, you find two wooden gymnastics rings, to inspire a healthy lifestyle. A very nice feature as well. The kitchen has a freezer, a two-stove burner, a micro oven, a dishwasher, and a small counter to arrange a meal. It’s not quite big enough to cook on a daily basis, but the apartments are also mainly designed for entrepreneurs, and you have lots of fine restaurants in the neighborhood as well as in the building itself. Around the building you find some cozy social spaces, that can be used whenever you have more guests over, or when you feel the need to socialize. It’s a nice option when you decide to live small.